Preserve your favorite voices, memories, and stories forever. StoryWings is a different kind of audio library where you and your invited guests can record and share favorite memories, songs, poems, and more...in your voice...in your language...and it is all safely archived and accessible for generations. IT'S PRIVATE, IT'S YOURS, and NOBODY IS ANALYZING YOU! Did you know that, according to their terms of service, our leading competitor FOREVER OWNS YOUR STORIES and forever makes them accessible throughout the world? Did you know that the 'big tech companies' collect data to analyze you on their 'free' content services so they can sell that data about YOU to their advertisers for 'targeted advertising'? The content is intended to be enjoyed within the library. There are no social share buttons because content should not be shared beyond StoryWings without the permission of the person who contributed it. LIBRARY OWNERS ARE IN CHARGE! They determine the theme of your library, who can participate, and what gets posted for your guests to access. IT IS QUICK AND EASY! Stories are recorded right in your library. Each can be up to 10 minutes long (but we find that the average recording packs a lot of love and value in less than 5 minutes). No editing necessary and we encourage natural speech...mistakes and all. NOBODY ANALYZES YOU and YOUR INFORMATION IS NOT SOLD! *The StoryWings Team does have access to content for administrative and support purposes but we do not monitor or access content unless compelled to do so because of a complaint or a law enforcement process. Each StoryWings audio library is a legacy gift that grows in value over time. Stay connected with regular updates and special messages. * Military family discounts available. Ensure that every generation hears treasured stories in the voices that first told them. 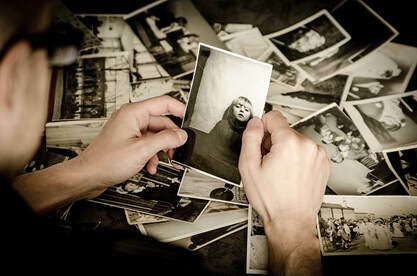 Enjoy the memories, voices and stories of loved ones with memory challenges. Preserve family histories in your own voice and in your own language! Record a story about favorite pictures! 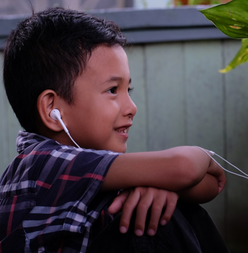 ​Each recording allows you to attach a digital image to view while listening to the narrative about it. "Anna Elizabeth was the youngest of the ten Cohan children and she was born on the boat coming over from Ireland. They called her the Little Dolphin because she was born on the water, she loved to swim, and she loved dolphins. Anna grew up to be a pediatrician and she had three children of her own. They lived in Corinth, New York, until 1976 when most of the family moved to Charleston, South Carolina. A funny story about Anna is..."
Want to be the first to get the NEW and IMPROVED StoryWings? Send us an email and add to the subject line: "I want StoryWings!" YOU will be one of the first to know when the next version is released, AND you will get a special discount for being patient while we complete and test our new features. Thank you! A StoryWings Audio Library is easy to establish and use! StoryWings makes a great gift! Who should become a StoryWings Librarian? ​Record your histories, stories, memories and more! ​Detail how you met and got engaged with stories about each of you before you met! ​Tell your stories for future generations. ​Share updates, jokes, silly stories and more! ​Tell stories about their life. ​Tell your story and create a time capsule of messages for future events. ​Record student stories to archive and share with parents! Record acts of kindness, success stories and more!